It’s both my pleasure and honour to write this post. Quite a few of you will know (of) me, but since that’s not necessarily the case I’ll try and make this a quick intro, as well as laying out some aspects of my thoughts and plans for the near future. A long time ago now, I was employee#25 at MySQL AB. During that period (2001-2007) I worked on the MySQL reference manual and built the docs team, spoke at many conferences, user groups and events, built the global community relations team and its activities, was program chair for the 2005 and 2006 MySQL Users’ Conference, taught training courses, and represented the company in Australia. I was born in Amsterdam, The Netherlands just before the first moon landing, and moved to Australia around the turn of the millennium. I live near Brisbane Queensland with Claire and my blended family of 4 teenage kids, a big cat and two chickens. From 2007 I founded and grew Open Query Pty Ltd, a services company specialising in MySQL, MariaDB and related infrastructure with mainly Australian and New Zealand clients. 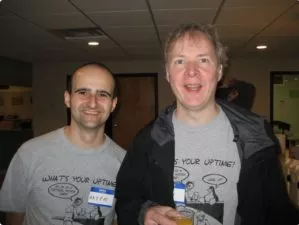 Along the way, we designed the OQgraph computational engine that is available in MariaDB, and contributed the early build system and DEB/RPM packaging as well as a range of patches from the OurDelta project when MariaDB first got started. Open Query was also an early donor to the MariaDB Foundation, through a small levy on its subscription fees. Open Query was recently acquired by Catalyst IT, a pure Open Source development and services company with offices in New Zealand, Australia and the UK. Catalyst offered me an interesting position as well, so I’ve been working with the Catalystas for about a month now. Those interesting events ran almost in parallel to being contacted about whether I’d possibly be interested in the MariaDB Foundation CEO position. A good number of conversations with Eric Herman (chairman of the MariaDB Foundation board), Monty, others, and some time later, here we are! Just to be clear, I am splitting my time between Catalyst and MariaDB Foundation. I’m skipping many bits of course, as this is not a resume. In any case, I have a broad range of experience with MySQL and MariaDB, programming, building and running organisations, understanding how commercial companies work in the Open Source space, employing and managing distributed teams, Open Source licensing and community, public speaking, and working with Monty. I believe that in many cases actions speak louder than words, but I’ve also always been one to speak up for what I feel is right and important, without fear or favour. I love delegation: it makes no sense to hover over competent people, and I wouldn’t hire anyone that isn’t. All that said, the buck stops with me, as that’s what being CEO also means. Coming in, I already see there are plenty of things happening, some new things to start, and some bits that need tweaking. However, the worst thing a new captain can do is adjust course before he gains a good overview. And the MariaDB Foundation, as steward of the MariaDB community and ecosystem, must operate as an integral part of that system. In the coming weeks, I intend to intend to spend time getting to know everybody internally, as well as many in the broader community. I want to tune in to what you think is important, what is good, what could do with a change, and everything else. My email address is my first name (at) mariadb.org. Remember, you can only be heard if and when you speak up. However, it’s often useful to converse in private first. I won’t do everything that’s asked, for a variety of reasons, but I will seriously listen and take your opinions on board. So please do contribute your thoughts to this process! Thank you. Last but not least, I would like to thank outgoing CEO Otto for his good work over the years and his helpfulness with the handover process, as well as the MariaDB Foundation board for their trust placed in me. It’s good to be more and globally involved with this family again!